As a trucker where do you get your news from? How do you stay informed about what is happening in the industry and what your competitors are doing? Newspapers and specialized magazines are fine as credible news sources, but most of them issue a new volume monthly or weekly, which is not often enough considering how fast-paced the industry is. If you are a trucker who is hungry for news, subscribing to trucking community blogs might be your best option. Nothing can beat the speed of getting news through the Internet, which is why a trucking community blog can be a very useful tool for every trucker out there. A quality blog can keep you updated on various topics and industry news, like the increased Freight Broker bond or the recently-announced winners of the National Trucking Competition. At the same time, you can also treat the trucking community blogs you follow as a small online industry convention of sorts. You can ask your professional peers for advice, let your voice be heard in the comments section, get in touch with proven experts and engage directly with the publisher, again through the comments. TruckingInfo is said to be the world’s largest fleet publisher. The website offers daily news updates and in-depth information on equipment, operations, regulations, environmental issues, and more. TruckingInfo has not one, not two, but three separate blogs for different topics, and as a reader, this can help you select with ease which news you are interested in and which you’d rather skip. The first blog is called “All That’s Trucking” and it is written by the editor-in-chief of TruckingInfo. It is her take on anything and everything related to trucking. The “Trailer Talk” blog focuses mainly on trailer-related news, but it also features news on different trucking innovations and techniques. The “On the Road” blog focuses on current trucking events. TruckingInfo also has a strong Twitter presence where you can follow their blog updates. Overdrive is one of the leading online magazines in the trucking industry. It first came out in 1961, and it has gradually turned into the premier magazine for leased owner-operators and independent owner-operators. It presents business and equipment features relevant to the owner-operator trucker, as well as trucking news, truck driving job listings and other trucking industry information of interest to the independent contractor. Overdrive also has three different blogs which you can follow, but Overdrive Extra is the one which is most tailored to satisfy the trucker’s curiosity for industry news. 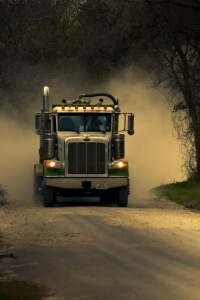 It covers a wide range of trucking-related topics. On Overdrive Extra, you can find information on everything, from the newest waxes and polishes that just came out to who the winner in the latest trucking beauty pageant was. You can also follow Overdrive on Twitter. Trucker to Trucker is exactly what it is sounds like—a blog which contains mainly articles that can be of practical use to any trucker. The trucking community blog is not focused on official news, but rather, it publishes articles with useful tips on how truckers can operate more efficiently or be healthier while on the job. Trucker to Trucker’s website also has useful tabs, which can assist you in getting a good deal on a trailer or truck purchase. Plus, you can get tips on which insurance company to choose or how to finance your business. Use the interactive nature of a community blog and connect with other truckers to exchange experience. Landline Magazine is the Official Publication of the Owner-Operator Independent Drivers Association. The Land Line Media Blog is an interesting trucking community blog, because it gives you an insider’s look at the trucking industry. Most of the blog posts are written in a simple and understandable way and they are not only knowledgeable, but also fun! The Land Line Media Blog is the blog, which you should go to when you want to be both informed and entertained. Also, if you are interested in the Owner-Operator Independent Drivers Association, the blog features a lot of stories, anecdotes and opinions told by the staff. Land Line Magazine also has a Twitter account, where you can easily track what is going on their blog and simply choose to read only the topics you are interested in. Ask the Trucker is an interesting trucking community blog as it was created to be more of an educational tool, rather than a newsy website. Trucking industry veteran Allen Smith first created this interactive blog so that students and beginning truckers with a lot of questions could turn to him for direct advice. The blog is intended to help truckers get a smooth start in the business, and equip newbies with enough knowledge, so that they won’t be taken advantage of. The best part is that you can get in touch with Allen Smith directly, which is the whole point behind the blog. Not many bloggers out there allow you the opportunity to form a personal connection with them. Ask the Trucker is a highly interactive blog, which is what makes it so influential. You can also get in touch with Allen Smith through his Twitter account. Reading through the blog posts of The Daily Rant, you can see all sorts of practical tips on trucking and the life of a female trucker. But you can also see the author’s beautiful Freightliner Coronado cruising through the most scenic roads of America along with descriptions of the numerous adventures that accompany her journeys. I highly recommend reading the “What I Do” and “What I Drive” sections before you start reading the blog itself. They will give you very detailed information about the author, her life and her truck, so when you read her updates, they will make much more sense to you. In conclusion, following a trucking community blog might be not only entertaining, but also very advantageous. You can benefit from a blog in so many different ways, from staying informed and finding good deals, to connecting with your peers and learning numerous tips on how you can do your job better from noted industry experts! Do you know of any other trucking community blogs which can do that for you? Leave a comment! Women in Trucking: Growing in Numbers and United!